Description: Electronic parts catalog Hyundai. All models produced and / or unreleased Hyundai Motor Company, except for vehicles intended for inter-market (eg , Starex), the model divided into groups (cars , SUVs / minivans / vans, commercial ) and by region . 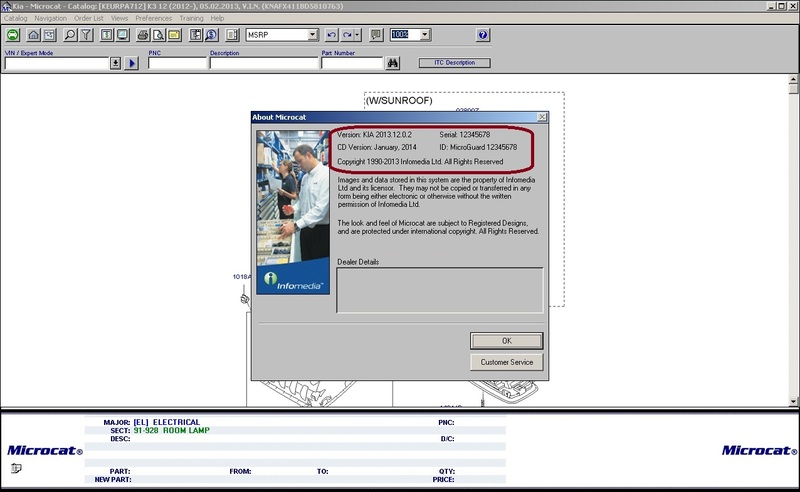 The catalog can identify the vehicle by VIN ( with filtering part numbers ) , search the name of spare parts ( partial or complete) , original number, and also shows the applicability of parts list of options with a breakdown for easy selection of the desired number in the absence of VIN- filter. Lang is possible to separate the interface , and separately for items of spare parts . Translation of names of spare parts is not always correct, so it is configured to include "language names of spare parts " - english. Built-in directory of original accessories, present in some of the previous versions presented here are not for all models. If no breaks VIN - read the instructions for updating the program and the opening of all regions! 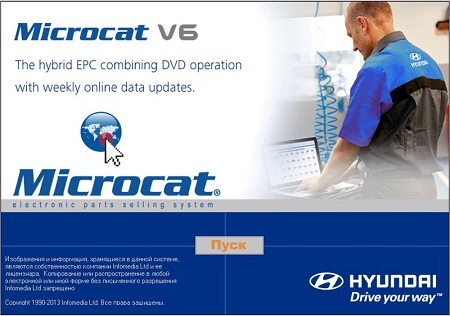 Microcat V6 online, which comes in addition, it works only with a password from the online service and hasp-key. After installation is complete abandon reboot. If installed in the default folder, you can simply run the file "run crack.cmd" folder "Lekarstvo". Replace the original file mg16.dll in a folder with a program to one that is in the hand (the folder "Lekarstvo"). File with the same name necessarily delete the folder "Windows \ system32". If installed in the default folder , you can simply run the file "run hywc.cmd" folder "Lekarstvo". Take the file "HYWc.dat" folder "Lekarstvo" and replace them the original file in the data folder "X: \ HYW_Data". ( For those who want to open yourself to all regions of the installed program : in the folder with the data "X: \ HYW_Data" is a file hywc.dat. Open this file in any version of Excel , it opens as a table. 1 - Run the program . 2 - Enter the username and password (if you go first , then create a user in the menu "Administration" - lower left button pop-up authorization). 3 - Choose any brand and close the pop-up " Vehicle identification " . 4 - Select the top menu "Help" - "Update data " . 5 - If it finds a new , go to the website link , enter the password "Microcat", download the update . 6 - Install and re- perform the treatment process. Do not forget - after updating need to undergo the procedure again a treat!